Info "Blast UFOs with nose missiles." Nasalblaster is one of The Job Center microgames in WarioWare: D.I.Y. The player has to draw the objects Wario's nose has to shoot. 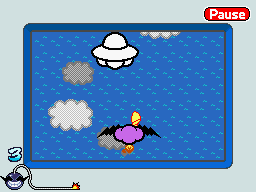 To win the game, the player must tap the missiles in Wario's nostril with correct timing to destroy a series of UFOs. If the supply of missiles is depleted or if one of them misses its target, the game is lost. "Shoot UFOs with my nose jet! You gotta design some scary aliens for me to blast!" This page was last edited on July 18, 2018, at 22:32.